Major truck maker of India, a Hinduja group company, Ashok Leyland have commenced the New Year with elegance and style. 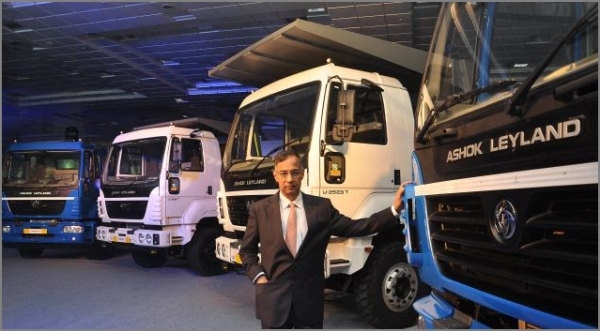 The opening of the year saw Ashok Leyland bagging big orders for its U-Truck range. After the coveted order of Rs 125 crores last month, Vijayanada Road Lines (VRL), a Hubli based logistic enterprise has placed another order from the company. Reports in the media revealed, Ashok Leyland has bagged an order of 262 vehicles from VRL logistics, for an estimated Rs 47 crores. The order has significance as it has been placed for its newly launched U-Truck range of vehicles. Ashok Leyland is banking heavily on this platform as the competitions heats up with Mahindra, Tata motors and other global truck manufacturer’s trying to mop away some numbers in this growing segment. It must be recalled that, in the previous month Rs 125 crores order was placed by VRL logistics with Ashok Leyland for 600 vehicles. The latest order is for12 units of U-4923, 50 units of Ashok Leyland’s 12-metre buses and 200 units of car carriers (the U-3518).